Frank Percy Wild (1861-1950) was born to Thomas and Mary in Leeds, Yorkshire and studied in Antwerp before finding fame as a portrait artist, doing commissions in America and landscapes of the Thames, near his family home of Marlow. He was listed in Who's Who 1941-50 and was a keen player in the cricket team and was seen about town dressed in Norfolk jacket, cycling breeches and tweed cap, accompanied by his smooth-haired black and white terrier. He married Beatrice Emily Chilcott in 1883 and moved to a large isolated house named Gossmore in Marlow, at around 1895. He had three children, Mona, who died aged 2, Enid, much painted and with gorgeous auburn hair and Douglas. His education was at Leeds Grammar School and Yorkshire College, his parents moving from Camp Road, Leeds to Bramley Grange, Thorner (now a teacher training College). He started training in engineering but took up art in 1884, studying in Antwerp, Paris and Spain, and in 1900 he was elected as a member of the Royal Society of British Arts. 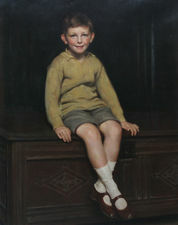 Between 1889 and 1926 he exhibited 20 paintings at the Royal Academy. He travelled extensively in America during 1907-1914, as recorded in the Ellis Island records, exhibiting and portrait painting in New York, South Carolina, Baltimore and Detroit. After his death on 14th April 1950, some of his paintings hung for several years in the council offices in Court Gardens, Marlow. He was buried at All Saints church, with the grave in a picturesque spot by his beloved Thames.